The Gold Circle Award recognizes individuals who have worked with distinction in the television industry within the Suncoast region of the State of Florida, the State of Louisiana, the Mobile, Alabama – Pensacola, Florida television market and/or the Commonwealth of Puerto Rico for fifty years or more. Gustavo is editor and executive publisher of Vista Magazine, a national dual language publication for the U.S. Hispanic market, with a monthly national circulation of a million one hundred thousand copies. Godoy has held numerous positions in the U.S. market as well as in Spanish language television. He started his career as a reporter/photographer for Miami’s NBC affiliate WCKT-Channel 7. He was hired as field producer and bureau chief for ABC News Latin American Bureau. In 1971 he was made Assistant News Director for Miami’s WCIX-Channel 6. In 1977 he was made Latin Affairs Director for Miami’s WTVJ-Channel 4 and also served as special assignment reporter on the Ralph Renick Report. Godoy organized live coverage of the Republican and Democratic conventions. In 1984 he became vice president and news director for S.I.N. After establishing and structuring Miami’s WLTV news operation, he was appointed Network Vice President News Director for Washington-based Spanish International Network. In 1986 Godoy produced Spanish language news, news specials and public affairs programs for the Telemundo Network. In 1987 he was made vice president and general manager of KTVW, Channel 33, in Phoenix, AZ. 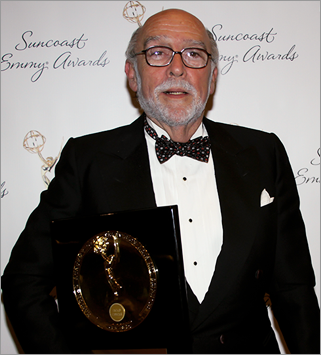 Gustavo is a four-time EMMY® Award winner. He developed and established the first Town Hall meeting Spanish format program in education as well as several news special programs covering national elections. He created the first exit polling system in the Hispanic market covering presidential and congressional elections. Godoy is active in professional organizations as well as in community service. He also is a regular panelist and guest speaker. Gustavo and his wife Virginia have five children and reside in Miami.